I’d never thought about creating a meal planner before. However, during the summer holidays I’ve really been feeling the pressure of entertaining a four-year-old, five days a week along with twin toddlers. We’ve been going on play dates, outings and doing activities continuously. 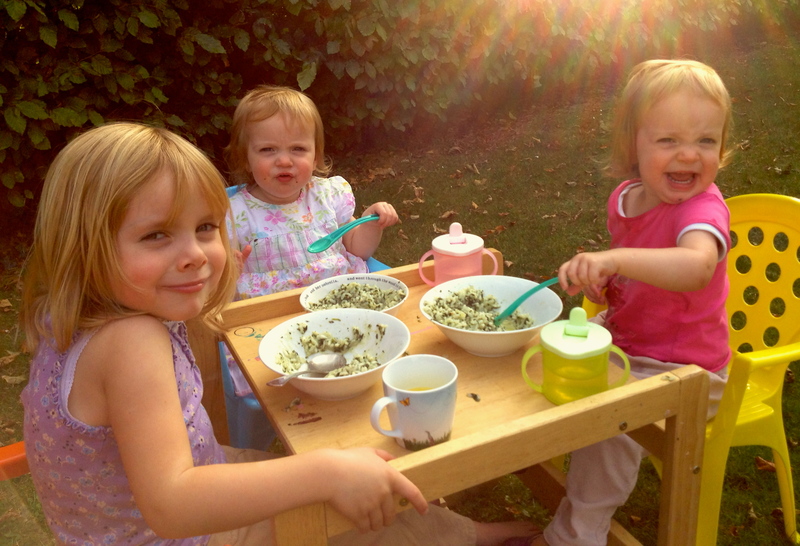 Dining al fresco with spinach risotto – a favourite. I can’t believe I have devised a meal planner, it sounds a bit sad and rather regimented, but I was getting totally fed up with being poorly prepared and spending way too much time at the supermarket checkout. I took an hour out and devised a planner for August. I tried to keep it fairly healthy and varied, but there were some meals, which were more of a ‘treat’ included; some favourites that cropped up a couple of times within the month, and leftovers also featured. I kept the weekends free in the name of spontaneity! It worked really well so I created one for this month. Another discovery – new sausages brand, fancy casings (find out more from DCW Casing). It might be overstating it slightly to say it’s revolutionised my life, but it has made a massive difference. Of course there’s the odd tweak now and then to fit in with last minute plans, but the main thing is I’m not waking at obscure hours thinking about the day’s food and I’m not fussing about trying to cobble something together out of the ingredients I do have, and most importantly I have drastically reduced my supermarket visits. I have also cut down a lot on waste as I go to the shops and buy what I actually need. I have changed, but being organised has actually made me chill out more. I’d highly recommend it! My housemate Sam is gluten intolerant and, well, a bit obsessive, but she uses a combination of Excel and Evernote to deal with planning her shopping and meals, which she has to do because of health and financial reasons. It’s all part of her using the whole Getting Things Done set of methods for organising things. Love Evernote. Just my sort of thing – thanks for the link. The weekend restock sounds brilliant, but might be a bit much for me. 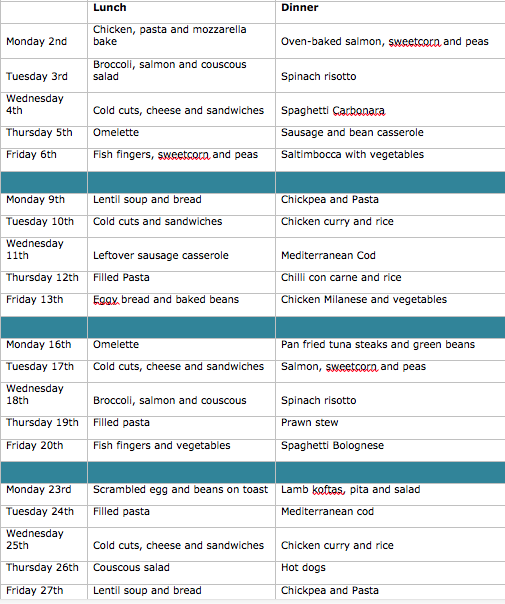 I’ve just come to terms with the fact that I created a meal planner. 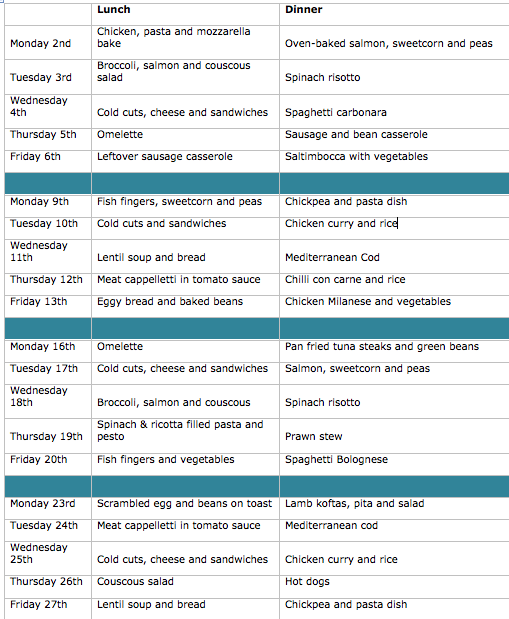 So smart to do your meal planning for the whole month at once. One less thing to worry about. Definitely. Saves a lot of time in the long run! !